What do philately and duels have to do with the RBSCP reading room? Pardon the cliché, but you never know what will come up each day in RBSCP, and personally, I enjoy when researchers share stories with me in the reading room. It is one of the most satisfying parts of my position as Public Services Senior Library Assistant in RBSCP. This particular surprise turned out to be an 1842 postage stamp brought to my attention by Dr. Stephen Valone, a history professor at St. John Fisher, while doing research in the William Henry Seward papers. Both the presence of an 1842 stamp and the correspondence itself were indeed surprising and intriguing. The postage stamp, an uneven small blue rectangle with a faded red “U.S.” inked over it, depicts an oval portrait of George Washington framed by the words “United States City Despatch Post Three Cents.” The design resembles the 1842-1846 6LB3 stamp, which was issued shortly after the U.S. government purchased the privately-held City Despatch Post in New York City, making it one of the earliest federal postage stamps. The letter is also extremely interesting. 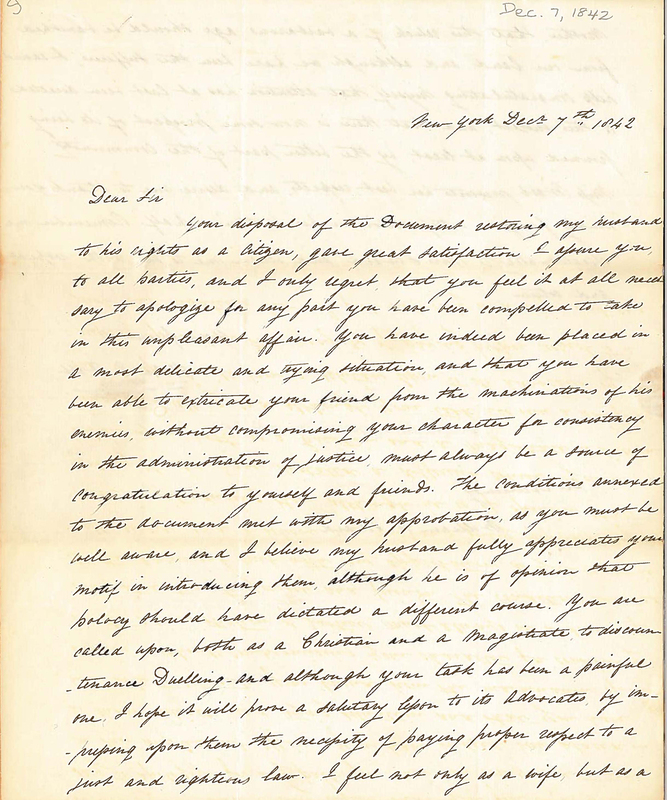 Helen Lispenard (Stewart) Webb writes to New York State Governor and family friend, William Henry Seward in December 1842, to express her appreciation of her husband, James Watson Webb, being pardoned for his participation in a well-known duel, while also clearly stating her disapproval of Webb’s involvement. Duels, an illegal activity, could (and did) land participants in prison. Selections from Fall 1842 correspondence in the William Henry Seward papers refer to Webb spending time in The Tombs and reflect volatile public opinion about the whole affair. Gov. Seward had a history of exercising limited clemency when approached with requests for pardons. Glyndon Van Deusen writes in his 1967 biography of William Seward that he “weighed the applications for pardon carefully and made it a general rule to issue none before half of the sentence had been served, granting clemency chiefly where they were doubts as to the justice if the conviction, where punishment had been unduly severe or where the culprit was youthful or insane. He made penitence an indispensable condition of release” (pg 84). Webb was undoubtedly grateful for this patronage and named one of his sons “William Seward Webb”. I think that last letter purporting to have been written by one of his friends (published first in the American) places the affair in a more horrible light than any thing I have seen on the subject…. one of his fellow creatures by his impetuosity, this reflection is sufficient to embitter many hours in the life of a person of sensibility. Dueling consisted of men fighting to defend one’s “honor” from a perceived slight or insult. This gendered method of conflict resolution inherently excluded women, while also clearly having a significant impact on them. So what did women think of dueling? 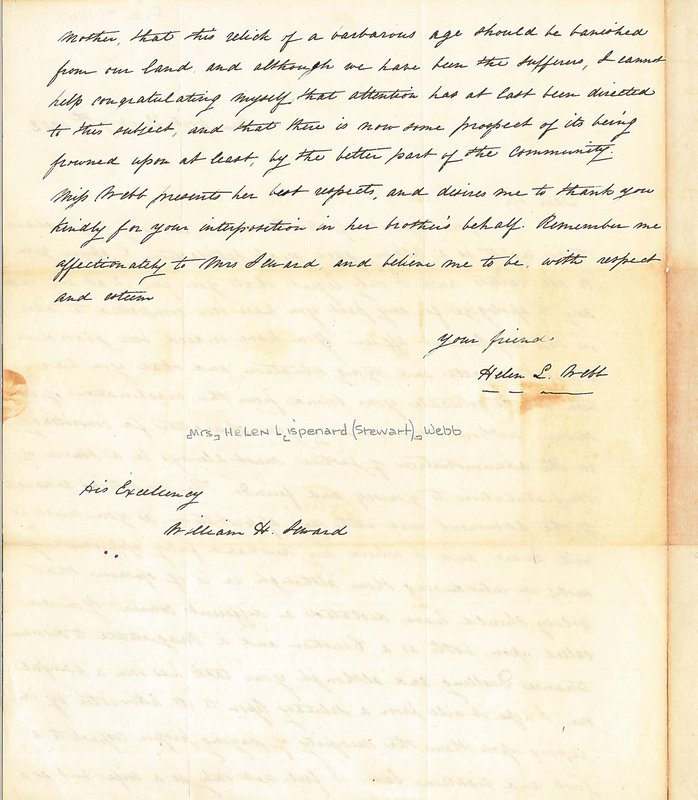 Correspondence from Frances Seward and Helen Webb provide valuable insight from their perspectives, indicating that these two women, at least, were not in favor of the practice. This overview of the Webb’s conviction and pardon barely scratches the surface of this hot topic in the Seward papers and there is still plenty of correspondence to delve into. From exclamations, whoops of joy, gasps, or a hushed comments to oneself, it is extremely rewarding to witness those moments of uncovering something fascinating, obscure, or vital to someone’s research. So if you find yourself doing research in RBSCP’s reading room- don’t hold back! Share these stories with us!